Free Comic Book Day 2014 is Saturday, May 3rd! Once again, both Collector's Edition and The Comic Book Store have purchased a special selection from the good publishers who sell them at cost. This year will also feature a special morning appearance at Collector's Edition by Arkansas' own chapter of the Empire's Stormtroopers: the 501st! They'll be watching the crowds for any suspicious droids. So put on your super-hero gear or manga/anime outfits and come on down to either store to enjoy the free comics and join the fun! Dress like a droid at your own risk, and yes, they are looking at you! Thanks to everyone who made our 2014 Free Comic Book Day the best ever! Special thanks go to the 501st, whom everyone had a great time meeting, and hauled away that rebel agitator named Luke Sky-something. A great time was had by all! If you've never been introduced to Doctor Who, or only seen shows from the New Millennium, the older mythos can be difficult to try and find where to start -- with so many decades of television history to chose from! Enter here to adventure in Time And Relative Dimensions In Space -- Part One! Part One dealt with the first quartet of Doctors, and Part Two examines the second quartet. The WILD STARS go digital! To read more about the special features of the expanded digital version of Wild Stars: The Book of Circles graphic novel, check out the new Hidden Wild Stars page! I've started a new section on the History of Comics. For the initial overview of how comics are made, start here. Tarzan of the Apes is the first subject. 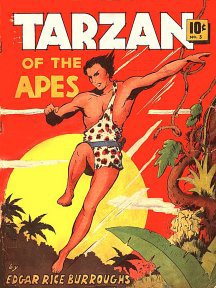 Tarzan is a character who has been an integral part of the comics industry since the very beginning of the artform. 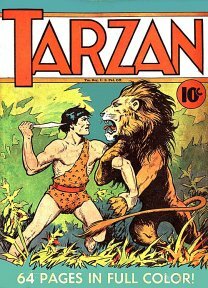 Click here for the full history of Tarzan of the Comics! The next Comics History page is devoted to the legendary Carl Barks. Carl Barks was always one of my favorite storytellers, being both an exceptional artist and extraordinary storyteller. It was a rare combination. If you'd like a quick tour of the career of the man who, because he worked in an age before printed credits, was known as The Good Duck Artist, all you have to do is click this link: Disney Ducks! Walt Disney Comics & Stories and Uncle Scrooge and the images on both sides are TM and (C) by Walt Disney Co. Both Collector's Edition and The Comic Book Store were a Destination Comics! feature location in issue #1664 (April 2010) of the Comics Buyer's Guide magazine. I've added a new section to try and dispell a common misconception about the comic book industry. Comic Book Store owners always get a bad rap, as the public perception is that we're all like the rude, Simpson's Comic Book Store Guy, laziing around, and surrounded by nothing but food and big stacks of Super-Hero comics. Like a Super-Hero, my other hobbies involve a mask and breathing apparatus, specialized training that includes rescue, dangerous activities and encounters with deadly animals, plus travel around the world to exotic locations, including a trip down the road to a lost civilization. Check out the new Dive Log. New page in the Bonus section. We've all heard of Good Luck Charms. Here are my experiences in surviving an extremely potent Bad Luck Charm. Decades ago I read a comment by award-winnning science-fiction and fantasy writer Michael Moorcock, who refered to writing as an act of exorcism. Another new page in the Bonus section. Nothing here to do with publishing or such. This page is a community service where I share, for the benfit of others, my experiences in dealing with lightning, felled trees and insurance companies. Even included a recent tornado experience. What's new with the Wild Stars? Now available for order is the 25th Anniversary Edition of Wild Stars: The Book of Circles -- Recalibrated! See the New Millennium section for more details. Or... check out the free preview of Volume 3 issue #4 presented in it's entirety! Or follow this link to purchase the Wild Stars on Amazon.com! For even more of the story behind the Wild Stars story, check out the Wild Stars Production Notes! Still haven't had enough Wild Stars? Check out the Bonus Section!